You’re sitting at your table, sipping on a glass of wine…then with a great flourish, the kitchen doors fling open, and out comes the waiter—pushing a gurney with an edible dead person lying on top. Dig in to the surgical opening, and use your chopsticks to furtle around for organ-shaped sushi, in a blood-red sauce. 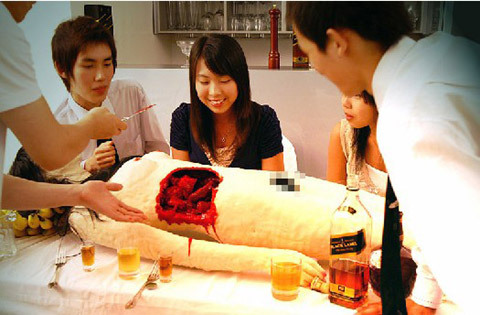 Incidentally, if you prefer the live ones, then look up nyotaimori – it translates as female body plate – at these restaurants you’re invited to eat conventional-shaped sushi off a live female body. Chodovar takes itself surprisingly seriously, with a museum and guided tours round this traditional Austro-Hungarian brewery. Surely most of the visitors are there for “the beer wellness land” though. Yes, readers – this is indeed the concept of using beer to enhance your body, rather than using it to reduce your body to a dribbling, blithering wreck. Apparently real beer baths help “harmonise the functioning of the organism” (whatever that means),as well as “having curative effects on the complexion, and hair, relieving muscle tension, warming up joints and supporting the immune system”. Balls. It’s just a poor excuse for a piss up. Look at this photo of one bather chugging a swift pint of bathwater. Apparently graveyards are good luck in India. I’m not entirely convinced — I’d say they’re a pretty clear symbol of somebody who’s not been that lucky. In fact, they’ve been so unlucky, they’re dead. 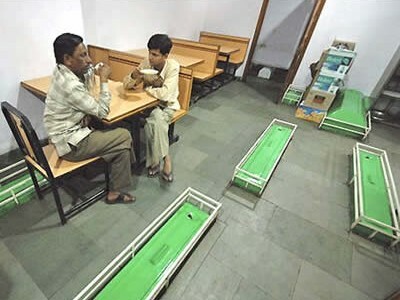 Anyway, these shin-high graves clearly bring some sort of luck to The New Lucky Restaurant—it’s been serving food to happy customers for forty years now, and apparently customers are still dying to get in. If you just love a badly-heated dinner on a plastic tray then this could be right up your street. 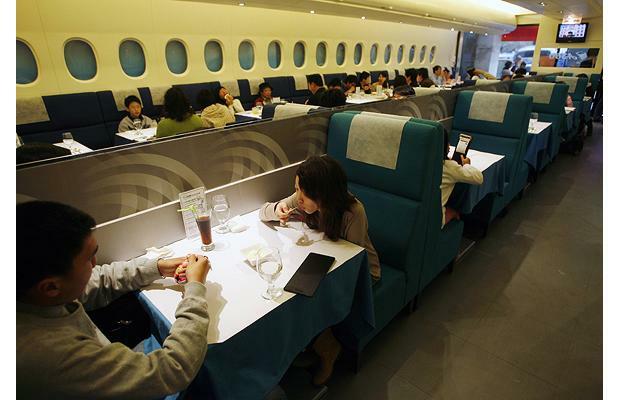 The A380 In-Flight Kitchen is modeled on a Superjumbo cabin—right down to the tight aisles which are just wide enough to squeeze a food trolley down. A possible birthday treat for plane enthusiasts, or people keen to reach the mile high club without the turbulence. This restaurant may look like a standard American diner, but it’s got a dark twist which pitches man against food: The Kookamonga Challenge. 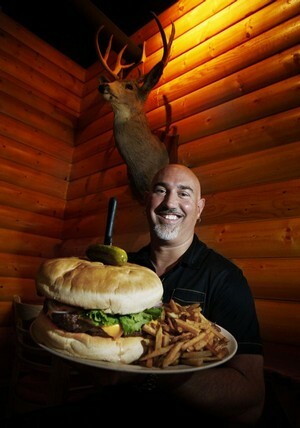 If you finish the kookamonga burger in 60 minutes, then you get it for free…the catch is that it’s 7.5lbs in total — that’s the average weight of a newborn baby. Apparently it takes 23 hours of playing tennis to burn off the calories. So far eight men have managed the challenge (3,130 have tried) — while seven of them forced down the last few morsels with just minutes to spare, the most mysterious victor is Patrick Bertoletti who gobbled it down in just 7 minutes and 15 seconds. Extraordinary. This place really is quite sick. 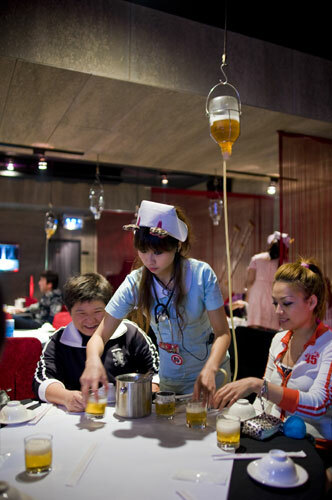 Diners order ‘medicine’ which is delivered to their tables by a waitress dressed as a nurse. A drip is then rigged up, and their poison of choice is served. Beer is served in sample beakers, and shots are administered by syringe. 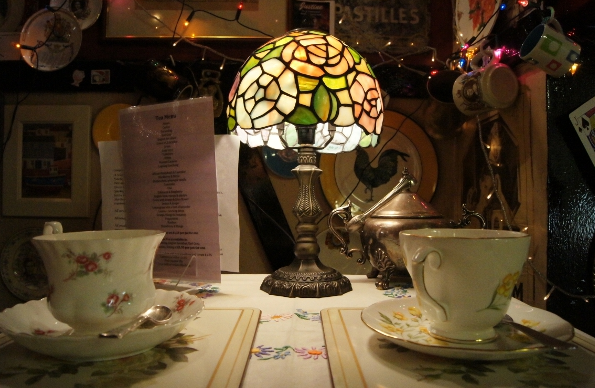 With Americans forcing their diners to gorge themselves on enormous burgers, and the Japanese inviting diners to dissect an edible dead body, it only seems reasonable that the Brits are lampooned with a ludicrous restaurant of their own. 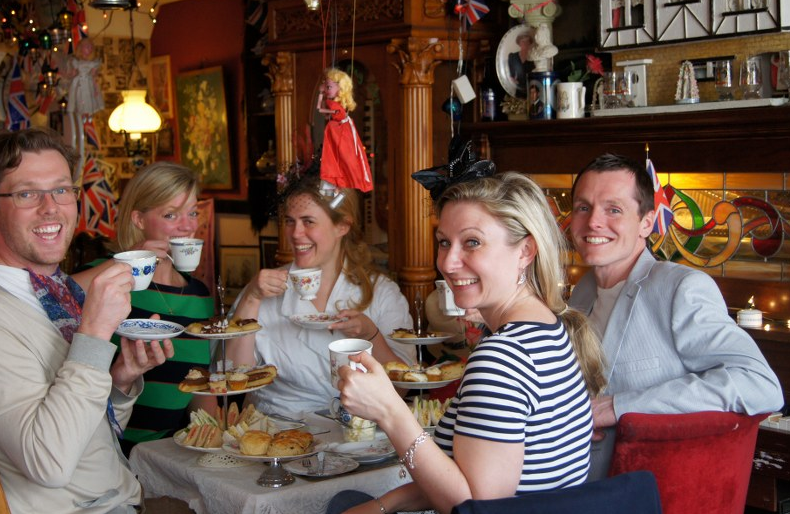 This is such a lame effort by the British- surely there are more fun/ odder venues than this? I want to thry the Cannibal in Japan, fancy a trip for some ‘work related research’?